Houston, TX — When the dice are down on the pass and you are coming up with sevens, that’s when you know your research is truly on point. No need for squabbling, no need for additional rolls. You got it done right the first time. 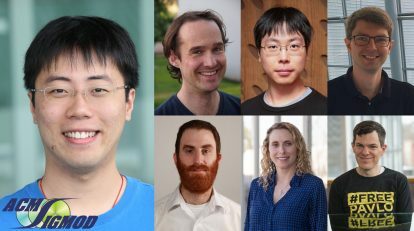 The Carnegie Mellon Database Group is pleased to announce that their latest paper SuRF: Practical Range Query Filtering with Fast Succinct Tries has won the 2018 SIGMOD Best Paper Award. The paper’s lead author author was CMU CSD Ph.D. Huanchen Zhang. This work was in collaboration with CMU professors Dave Andersen and Andy Pavlo, CMU post-doc Hyeontaek Lim, TUM visiting scholar Viktor Leis, Hewlett Packard Labs’ Distinguished Technologist Kimberly Keeton, and Intel Labs’ senior research scientist Michael Kaminsky. More information is available at the SIGMOD Awards Talks announcement. Source code for the SuRF project is available at https://github.com/efficient/SuRF.